Every couple of months I like to give my children’s rooms a mini makeover, by adding a little colour or new item. Something I have been loving lately is wall art. Painting the walls is not an option because we rent so adding a picture or two gives the room the perfect little lift it needs. Etsy store Small Adventure has a large selection of finely printed handmade paper goods that really do add some adventure to your little one’s room. If you have a dinosaur crazy babe, like me, that answers every question with a roar then they will adore waking up to their dino print. Maybe they prefer butterflies like my four-year-old? Then they will enjoy this exquisite butterfly print hanging on their wall or even sitting on their bookshelf. 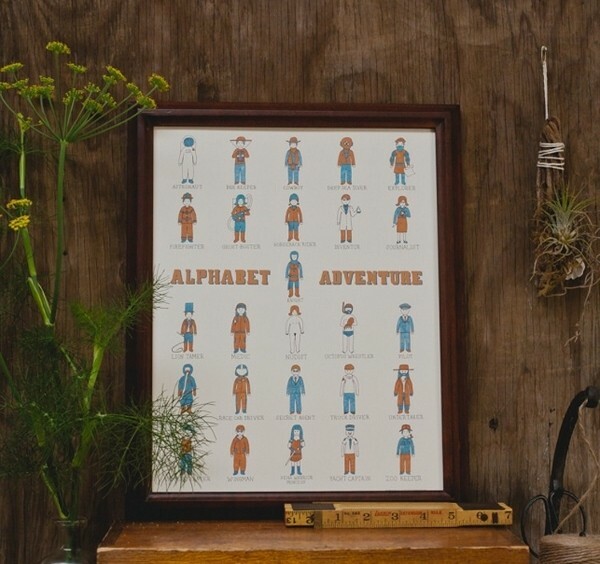 It’s never to early to introduce your child to the alphabet and Small Adventure have just the print to help, this alphabet adventure print is too cute for words and would even look great in the playroom. The prints vary in price starting at US$10 for the smaller prints and US$28 for the larger ones, all available from Small Adventure on Etsy.